Target Corporation (TGT) operates general merchandise stores in the United States. As of January 29, 2011, Target Corporation operated 1,750 stores in 49 states and the District of Columbia under Target and SuperTarget names. The company is member of the S&P 500 and the S&P Dividend Aristocrats indexes. Target has paid uninterrupted dividends on its common stock since 1965 and increased payments to common shareholders every year for 44 years. The most recent dividend increase was in June 2011, when the Board of Directors approved an 20% increase to 30 cents/share. The largest competitor of Target Stores includes Wal-Mart Stores (WMT). Over the past decade this dividend growth stock has delivered an annualized total return of 4.10% to its loyal shareholders. The company has managed to deliver an increase in EPS of 11.40% per year since 2002. Analysts expect Target Stores to earn $4.17 per share in 2012 and $4.48 per share in 2013. 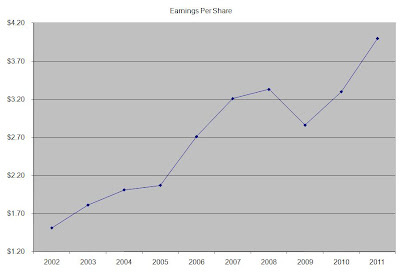 This would be a nice increase from the $4.00 /share the company earned in 2011. On average the company has managed to repurchase 2.80% of its stock annually over the past decade. The company differentiates itself from Wal-Mart (WMT) by catering to a more upscale audience in comparison to the world’s number one retailer. In addition, Target has started a campaign to renovate almost one quarter of its existing stores in order to add fresh foods to their assortment of goods offered. In addition, it is planning on increasing its store count by over 1%/year in the next few years, as well as enjoying higher same-store sales boosted by clever advertising. Future growth could be aided by the company’s recent news that it plans to acquire 220 retail locations in Canada for almost $2 billion. In addition to that, Target plans to open 100- 150 new stores in Canada over the next two years. While this deal would be dilutive to earnings per share over the next two years, it should add to overall profitability going forward. While it is a major retailer, the company also has significant operations related to its RED Card, which allows shoppers to obtain a 5% discount on nearly all purchases. This loyalty program is expected to add two percent to same-store sales and result in positive EPS by 2012. On the other hand, Target is looking to sell its credit card receivables portfolio, worth almost $7 billion dollars to a strategic buyer. While the company saves on transaction costs by having its own store credit card, it takes on credit risk, which could detract from profitability. 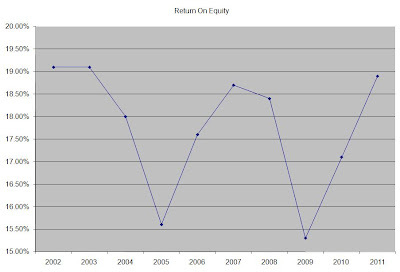 The company has been able to generate a return on equity in between 15% and 19% over the past decade. Rather than focus on absolute values for this indicator, I generally want to see at least a stable return on equity over time. The annual dividend payment has increased by 14.90% per year over the past decade, which is much higher than the growth in EPS. 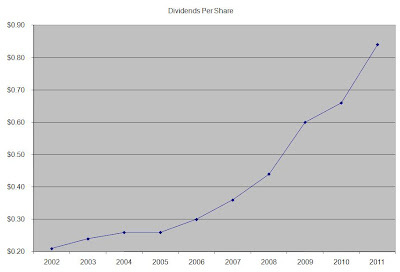 A 15% growth in distributions translates into the dividend payment doubling almost every five years. If we look at historical data, going as far back as 1986, we see that Target has actually managed to double its dividend every six years on average. 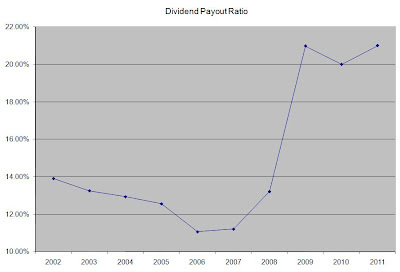 Over the past decade the dividend payout ratio has increased from 14% in 2002 to 21% in 2011. This has mostly been as a result of dividend growth being faster than earnings growth. A lower payout is always a plus, since it leaves room for consistent dividend growth minimizing the impact of short-term fluctuations in earnings. Currently Target is trading at 11.40 times earnings, yields 2.60% and has a sustainable dividend payout. The company fits my entry criteria and I would consider initiating a position in the stock subject to availability of funds.